Jim Jarmusch opens Gimme Danger, his documentary about the legendary punk rock band The Stooges, on a downbeat note: not with Iggy Pop’s and/or the band’s beginnings, but with the point at which they initially separated, not too long after the release of their third album, Raw Power, in 1973. It’s an unexpectedly daring way to start a movie about the band Jarmusch considers “the greatest rock band ever,” as he willingly admits in an early title card—an opening that suggests a refreshingly honest approach to even a band he reveres. This initial impression is buttressed by Jarmusch’s decision to identify Iggy Pop not by his more famous nom de guerre, but by his real name, James Osterberg, thereby implicitly lifting the veil on the famously anarchic stage personality, bringing him back into the human realm. Alas, Jarmusch’s innovations with the genre more or less end there. Gimme Danger proves to be more or less a straightforward rock documentary from then on, tracing the rise, fall, and subsequent revival of The Stooges over the decades. Talking heads predominate, with band members Iggy Pop; drummer Scott Asheton in archival interview footage (he died in 2014); his brother Ron Asheton—who was the Stooges’ guitarist on their first two albums, The Stooges and Fun House—also in archival footage (he died in 2009); and James Williamson, the guitarist on Raw Power, all contributing. (Also appearing in the film is the man who discovered them, Danny Fields, recently the subject of his own documentary, Danny Says.) Even Jarmusch, it turns out, draws on the recent documentary cliché of illustrating interview anecdotes through animation—in this case, using stop motion to depict scenes from Iggy’s childhood living in a trailer in Ann Arbor, Mich. Anyone expecting anything formally inventive from this usually boldly iconoclastic filmmaker will be disappointed. Even his previous foray into nonfiction, the Neil Young/Crazy Horse documentary Year of the Horse (1997), showed a more restless visual imagination than Gimme Danger does. Still, at least there’s Iggy Pop, who may no longer be the fireball he was onstage, but who recalls his own life with refreshing forthrightness and august reflection. Perhaps Jarmusch’s relative aesthetic plainness could be said to echo its subjects: Iggy, the Ashetons, Williamson and the rest all exude an air of former bad boys looking back on their halcyon days nostalgically but without sentimentality (Williamson, after all, became a highly successful electronics engineer after his stint with The Stooges). 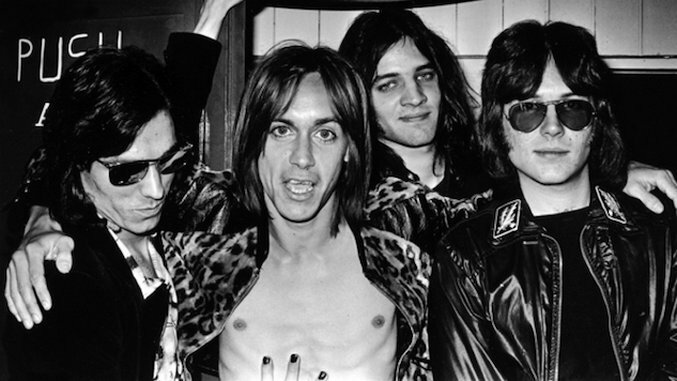 Even Iggy’s magnetism, however, isn’t enough to paper over some of the telling gaps in the film: relatively little mention of the tensions within the band during its late-’60s/early-’70s prime that explains, say, why Ron Asheton wasn’t present on Raw Power; a superficial grazing of Iggy’s prevalent drug use; and a near-complete passing over of Iggy’s career as a solo artist before the Stooges reunited in the 2000s. By jumping from their breakup to their reunion, Gimme Danger reveals itself to be Jim Jarmusch’s own Shine a Light. Just as Martin Scorsese’s 2008 Rolling Stones concert documentary could be said to be the director’s own celebration of the supposed eternality of Mick Jagger and co. even in their advanced age, Jarmusch’s film is ultimately a heroic celebration of not just the longevity of the Stooges, but of an artist’s ability to remain forever young despite the inevitable ravages of time. Kenji Fujishima is a freelance film critic, contributing to Slant Magazine, Brooklyn Magazine, The Playlist, and the Village Voice in addition to Paste. He is also Deputy Editor of Movie Mezzanine and former editor-in-chief of In Review Online. When he’s not watching movies and writing and editing film criticism, he’s trying to absorb as much music, art and literature as possible. He has not infrequently been called a “culture vulture” for that reason.